Arunachala arises from the plain of Tamil Nadu, in southern India, a commanding presence over the landscape. 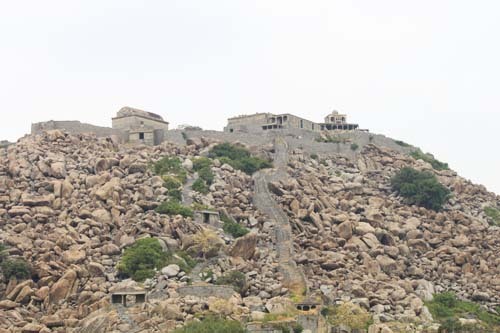 It is the king of mountains; dotted here and there are many other rocks rising up out of the flat plain – rounded, extremely ancient, a remnant of some distant geological event, none is in any way a rival to Arunachala. The story told about the origin of Arunachala is that one day the Gods Brahma and Vishnu were having a discussion about who was more important than the other. Overhearing this argument, Shiva thought they were both being rather silly, and he manifested as a tremendous towering column of fire, stretching as far up as the eye could see, and reaching far down into the center of the earth. Brahma and Vishnu were amazed at this display of power. Brahma became a swan; the swan is Brahma’s vahana or vehicle, and he flew far, far up into the heavens searching for the top of the column of fire. He was never able to reach the top; it seemed limitless, extending up forever into infinity. Meanwhile Vishnu took the form of a boar; the boar Varaha is one of the avatars or manifestations of Vishnu, and boars are very good at digging in the earth. Vishnu as the boar dug and dug, with all the energy he possessed, but he was never able to get to the bottom of the column of fire that was Shiva. Overtime, Shiva, the beautiful column of fire, congealed into rock and became the great mountain of rock, Arunachala, worshipped for thousands of years as the holy presence of Shiva himself. Modern day scientists know that fire, or molten rock, does indeed congeal into rock; it is known as igneous rock and is one of the primary ways that the mantle of rock on the earth is formed. The English word “igneous” comes from an ancient Indo-European word, from which comes also the Sanskrit name, “Agni,” who is the Hindu God of Fire, first worshipped many thousands of years ago by the authors of the Vedas. While modern science has a very detailed grasp of the geological processes that form the rocks of the earth, there seems to be less acknowledgement and less awareness of the presence of a divine spirit — of the Gods, who are the origin and the essence of these processes. It is considered more acceptable these days to acknowledge only the physical and not the spiritual. Yet perhaps this is a mistake, and perhaps the ancient seers were more accurate than we are today in their perceptions. Perhaps the myth is more truly the reality. Arunachala is now, as always, one of the most sacred sites in India. The five elements, which are earth, air, water, fire, and ether or space are represented in the geography of India as five sacred sites of the God Shiva, each having a temple at a particular location. 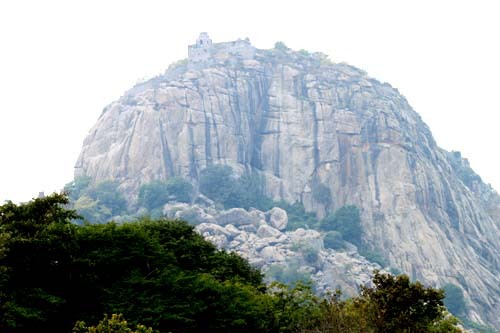 Arunachala is the site of the element fire. Sri Ramana Maharshi, the early twentieth century saint who lived at Arunachala, said that Mount Kailash, in the Himalayas, is the abode of Shiva, but Arunachala is even more holy and is Shiva himself.